Like most artists working with digital media I use several software applications. Sometimes I may use as many as six or seven programs to produce a single finished image; especially if it involves 3D modeling – whatever works to get the job done. One program I have used for quite a few years now is Project Dogwaffle. I began with the freeware version and was very impressed; it was also a lot of fun. There have been many updates over the years and I upgrade every so often. A few days ago I upgraded to the latest version, known as Howler. No single application does everything, but Howler is a very sophisticated, though generally easy to use program. In addition to the standard painting functions that you would expect you can also make animations. 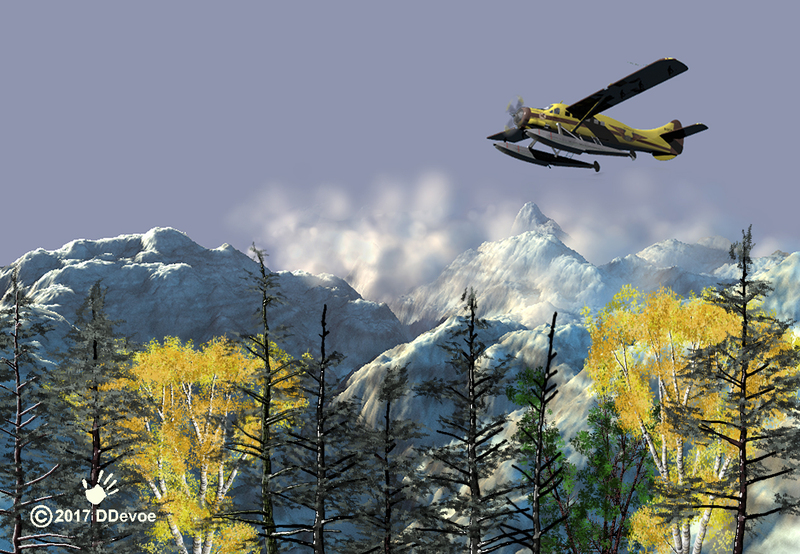 Special settings for “painting” foliage are also included and some time ago the ability to generate 3D terrains was incorporated. I have been tinkering with my new toy and thought I you might interested in the results. There will be more examples and explanations of how I use Dogwaffle in conjunction with other software posted here in the coming weeks. I am always experimenting and trying to push the envelope of what can be done. My friend Philip Staiger who helped develop various versions of Dogwaffle will also probably be posting some of it and additional material at his website, thebest3d.com. He has also made some very good video tutorials. My thanks to him for his recent assistance. As I said 3D terrain modeling has been a feature for some time and, like the other capabilities, it gets better with every new version. The ability to work both 2D and 3D in the same software makes some things much quicker and easier. Here is the first image I worked up in Howler. I probably should not have put my copyright mark on it as I, more or less, slavishly followed the steps outlined in a video tutorial by Dan Ritchie who developed Dogwaffle. I really like how Howler handles fog. To generate a 3D terrain you need a black and white image where the lighter the shade the higher the elevation; I call this a bump map. 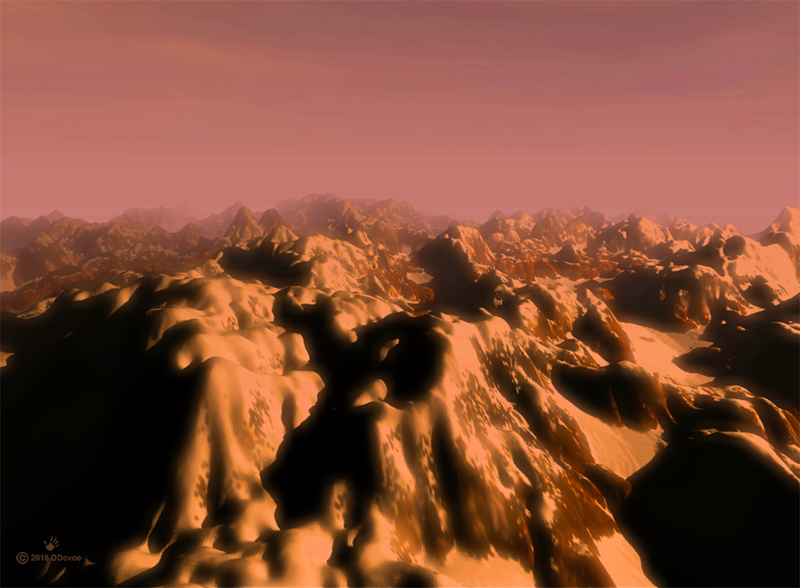 Here is a bump map for mountainous terrain. A simple, black and white, overhead image – think topographic map where the lightest shades are the mountain tops and the dark shades are lowlands. These are very easy to make by rendering plasma clouds. 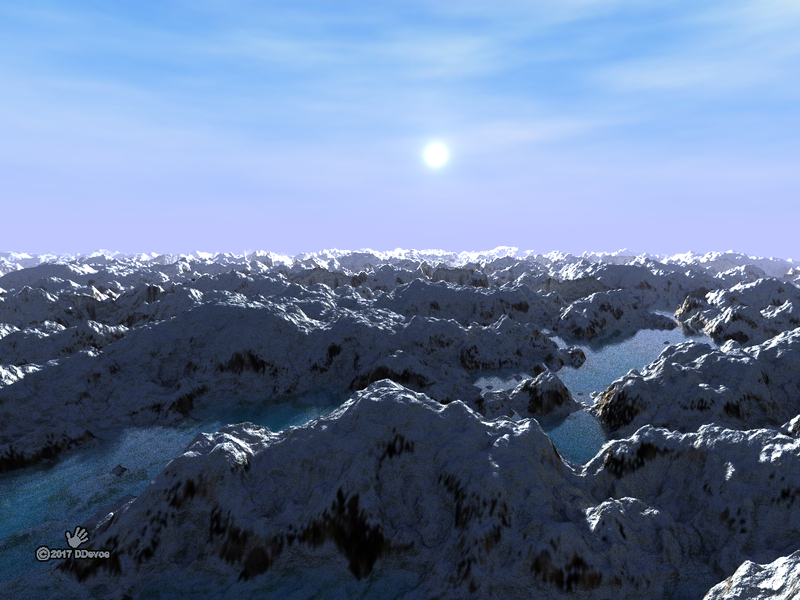 Here is a screenshot of the same bump map inside Howler’s 3D designer filter. Notice the terrain is a light neutral color. On the right you can see a panel with some of the many settings you can adjust. 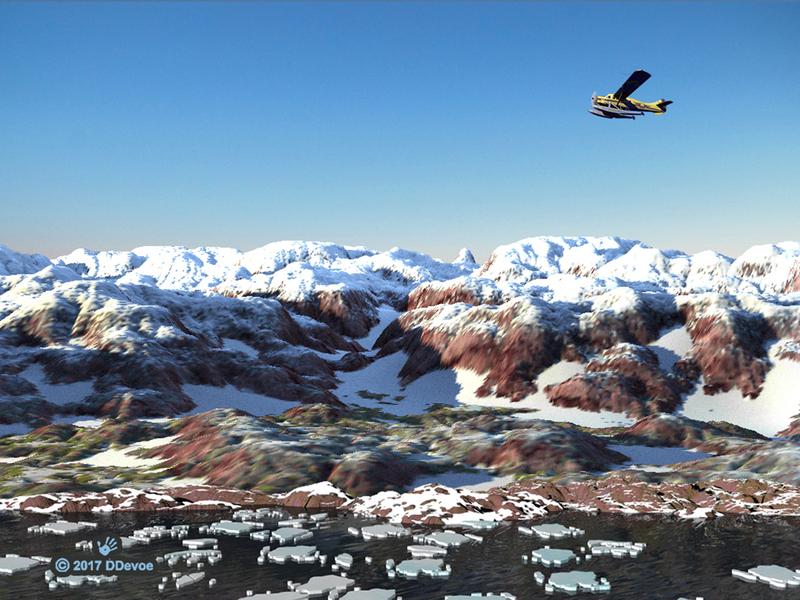 The next step is to apply an image map, a texture, to the terrain. This is a simple image map made by again rendering plasma clouds, adjusting the color and adding a rock pattern to make it more interesting and realistic. As with rendering plasma clouds this is quick and easy to do. 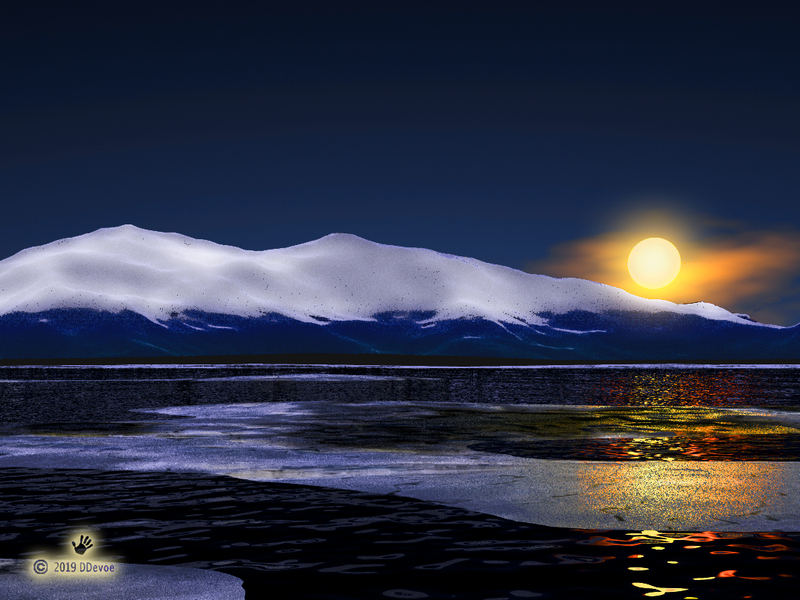 For the sake of brevity I left out a couple of steps required to add the snow. 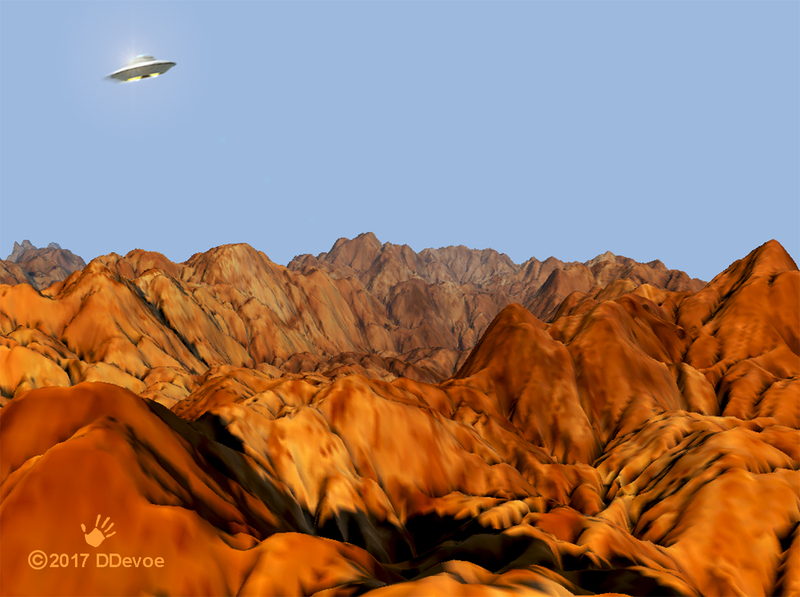 The same image map applied to the terrain bump map in 3D designer. 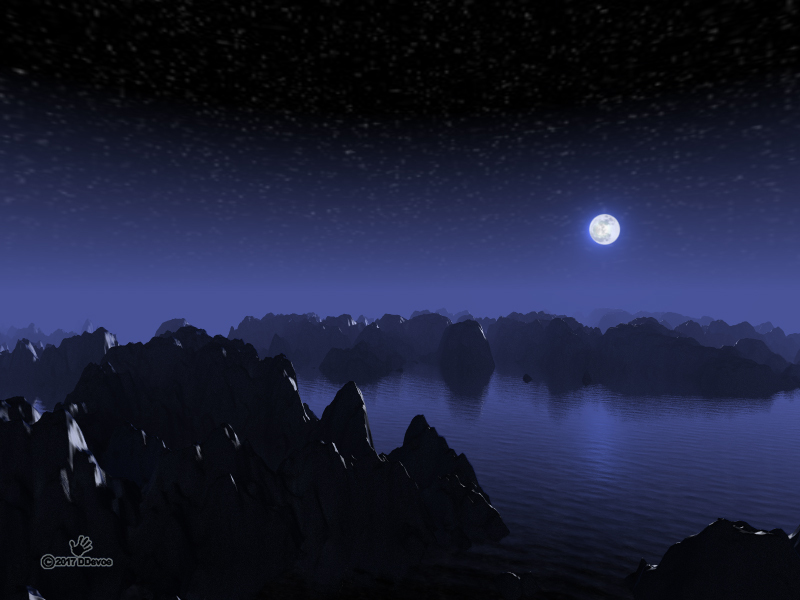 By adjusting a multitude of settings – elevation amplitude, illumination, point of view, etc., etc., etc., anyone can make a nice scenic view. Here is another doodle I made. Except for the Northern Lights, which I made with other software, everything in this image was done with the Howler version of Dogwaffle on the same manner as outlined above. You can also make some very nice Northern Lights in Dogwaffle. One other thing you might find to be interesting. Here’s a fractal image I made some time ago. After running it though the same process as above – I was curious what would happen – this is the resulting image with the illumination set to make the relief more visible. I definitely recommend Dogwaffle to anyone, from beginners in digital arts, to professionals with many years of experience.